Rebound Expectations - Analysts compiled by Bloomberg expect the energy sector to have the biggest price return over the next 12 months, more than double the estimated advance for any other sector. Digging Deeper - Analysts compiled by Bloomberg forecast explorers and drillers to have the highest returns within the energy sector over the next 12 months. The increase in market value in 2017 alone for Apple, Google, Amazon, and Facebook, has surpassed the entire market value for some of the largest companies including Boeing, Schlumberger, United Parcel Service, Goldman Sachs, Starbucks, and Nike just to name a few. 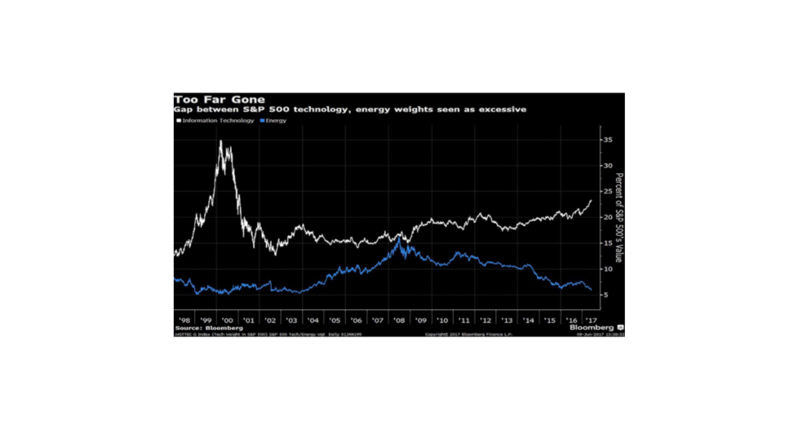 The gap between the S&P 500 technology sector and the S&P 500 energy sector is the widest since 2001, a level we do not see as sustainable.